Soapstone countertops are not as widely known as granite or quartz, but have many properties that make them a viable alternative to other natural stone countertops. This naturally quarried stone is softer than most other natural minerals, but soapstone is very dense and non-porous. Since soapstone is impenetrable, it will not stain and no liquid will permeate its surface, as can happen with marble, slate, limestone or granite. Other stones, including granite, have a propensity to soil; this is why soapstone (steatite) is widely used in chemistry lab countertops and acid rooms. In addition to soapstone’s material characteristics, it’s soft elegance gives your home or business a distinctive look that is easy on the eye with soft tones and colors, and flowing accents marks. Choose from grays, blues or greens to match other soft tones in your home. Combine soapstone countertops with soapstone sinks or floors and rich woods to give the room a European flair. Call Counter Act 580-220-8810 for Soapstone Countertops. There are many different varieties of natural stone that can be used for custom countertops and vanities, but soapstone countertops and vanities are different from all the rest. In addition to using soapstone in its natural color, you may choose to oil or wax the soapstone for a darker and richer look. Each of the eight Brazilian stones that are used in making countertops and sinks has a unique color scheme and except for leathered Minas, oiling the stone enhances its original color. 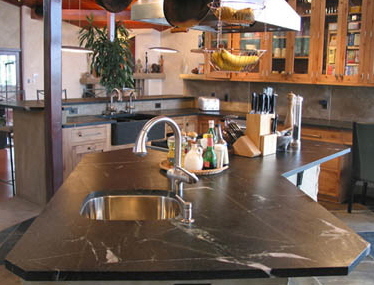 Not only does the use of soapstone enhance the beauty of the your custom countertops, it is a durable stone that retains its beauty without a lot of maintenance. 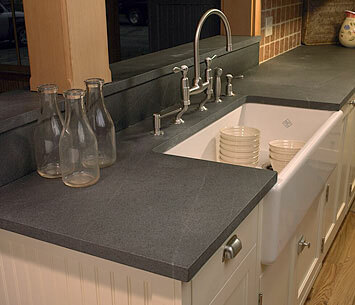 Because of the versatility of soapstone, there is no “one size fits all” style or texture. Choosing what is best for your home is easy with soapstone because of the different varieties that are available. The variety of colors and their marbling effects make it easy to find the right countertops to complement the appliances and cabinetry that are in either your kitchen or bathroom. Medium pearl gray with flowing emerald colored veins. When oiled, turns dark black with a small amount of dark green marbling. This stone has a light – medium texture to the surface. Medium to dark green base with with clear white veins. When oiled dark black undertone with dark green marbling and clear white veins. This stone has a light – medium texture to the surface. Medium to dark green base with emerald Veins. When oiled dark black undertone with dark green marbling. Light grey with charcoal. When oiled dark charcoal colored with subtle white veins. Light grey with blue. When oiled dark green colored with white veins. Light blue grey with small to medium white veins. When oiled dark black with small to medium white veins throughout stone. Medium blue with small to large white veins. When oiled dark green to black with small to large white veins. Counter Act Countertops fabricates and installs Granite Countertops, Quartz Countertops, Soapstone Countertops, SileStone Countertops, and Cambria countertops and vanities in Southern Oklahoma and Northern Texas. 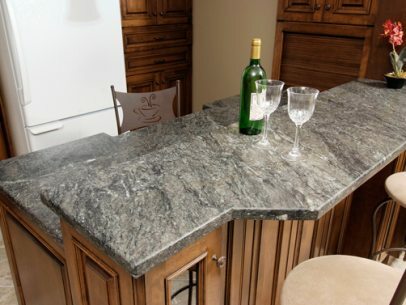 We fabricate granite countertops and quartz countertops for Oklahoma cities including the areas of Marietta, OK, Lake Texoma, Ardmore, OK, Kingston, OK, Edmond, OK, Blanchard, OK, Mustang, OK, Oklahoma City, OK , Duncan, OK, Wilson OK, Lawton, OK, Durant, OK, Norman OK, Wynnewood OK, Purcell, OK, Ada, OK, Tishomingo, OK, Headlton, OK, Ringing, OK, Lone Grove, OK, Duncan, OK, Comanche, OK, Waurika, OK.
We fabricate and install granite countertops and quartz countertops in the North Texas cities of Fort Worth, TX, Dallas, TX, Arlington, TX, Plano, TX, North Richland Hills, TX, Carrollton, TX, Sanger, TX, Mckinney, TX, Frisco, TX, Celina, TX, Gainesville, TX, Sherman, TX, Denton, TX, Pilot Point, TX, Gainseville, TX, Pottsboro, TX, Munster,TX, Whitesboro, TX. We also are dealers for Jetta whirlpool tubs and Rugby sinks. We provide quartz, natural marble, engineered marble (Portofino) and granite countertop installation in residential and commercial buildings for new construction or kitchen remodeling. Thank you for choosing Counter Act Countertops! Call Counter Act Countertops at 580-276-2886 for a free estimate. Copyright © 2018 Counter Act Custom Countertops. All rights reserved.